Programming note: For nearly two years, New South Essays has been published on Friday mornings. Because of my job change, I’m finding that Saturdays are working better. I hope you’ll stick with me as I move to Saturdays. To ensure that you never miss a weekly post, click the email subscription link on the right. Thanks! Carlton at 4 had no trouble picking up Space Invaders. Fast forward to Christmas. During our visit to my parents in Lake Wales, Fla., we took the boys to see “Wreck it Ralph,” one video game villain’s quest for heroism that featured a walk down arcade game memory lane with dozens of characters from video games of the past. It was one of those occasions when the boys stared at me in wonder as I laughed out loud at what they thought were inappropriate moments. On the night we arrived in Florida, not long after opening our gifts from Mom and Dad, we discovered my mother was obsessed about one Christmas gift she ordered on Amazon that didn’t get delivered in time. True to my parents’ form, they had ordered one for each of their three sons, but it had not arrived for any of us. Sitting at her computer, Mom diligently followed the tracking number across the country and each morning over my coffee she updated me on the shipping status of the mystery gift. Honestly, I had forgotten about it by Wednesday when I returned to work. With the resumption of my routine, Christmas and its gifts were far from my mind when the UPS truck pulled up outside our home. Then I remembered there was one more gift to open. We made the boys wait until after supper before diving into the plain cardboard box. I could not have predicted the bizarre emotional reaction I felt when the “Atari Flashback 4” emerged. I stared at the box, not with the eyes of a 42 year-old father of three but with the eyes of a 10-year-old on Christmas morning unwrapping a pulse-quickening, hours-wasting, life-changing, dream-making device. It was the Holy Grail. It was my Red Ryder BB gun. It was the most amazing device my brother and I had ever seen. Desperate to plug it in and get started on the 75 games that came pre-programmed on the slightly smaller console, the boys pleaded and begged for me to set it up. As I examined the contents, I had that strange feeling of deja vu. The console and power pack were smaller. The joysticks were wireless. There were buttons on the front of the console where the little levers used to be. I was both taken back in time and a little confused. So I did what any parent does in those moments: I sent the boys to bed. I needed time to sort this out. No, I didn’t need help plugging it in and turning it on. I needed to sort out the complex emotions this gift evoked. 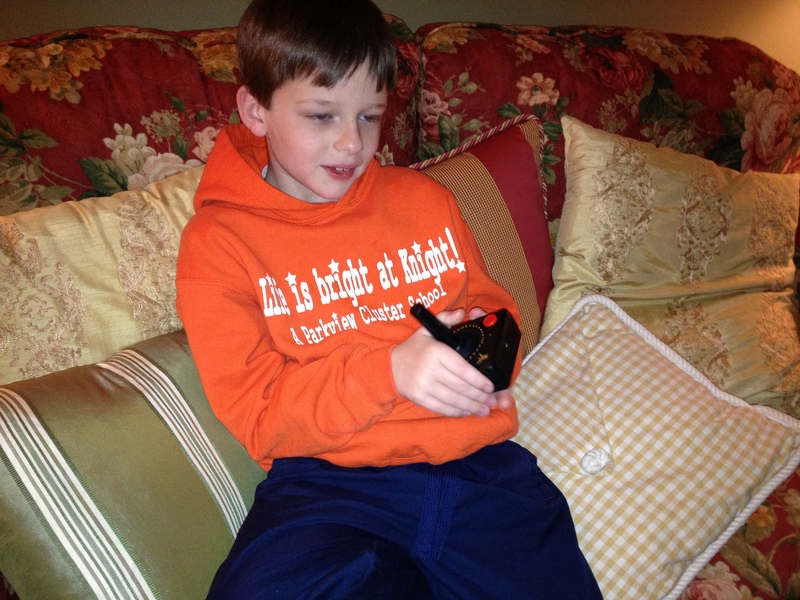 Harris didn’t know what to do with the overly simple controller at first. By the time I got home from work on Thursday, the boys had figured out how to hook up the system. The family was gathered in the living room around the “old TV”. As I made my way from the kitchen, I could hear the rumble of tanks. The appropriately named “Flashback” did just that, taking me back to my youth when my brother, Lee, and I would press the red buttons and strain the vinyl-covered stick as we tried to put English on the bullets coming from our tanks. Video games have played a part in my life almost since I was old enough to play them. Seeing that Atari’s Pong had turned 40 and then seeing this “Flashback” console made me wonder what will be the retro toys my boys will find memory-provoking 40 years from now. I can’t imagine where technology is headed. I just hope my boys will have positive memories from their wasted hours playing video games together. For me and my brothers, the memories are what made the wasted hours worth it. So what’s your earliest memory of video games? What was your favorite? Were you an Atari or an Intelivision person? Did you blow untold fortunes in quarters at the arcade? Share your memories by leaving a comment below. 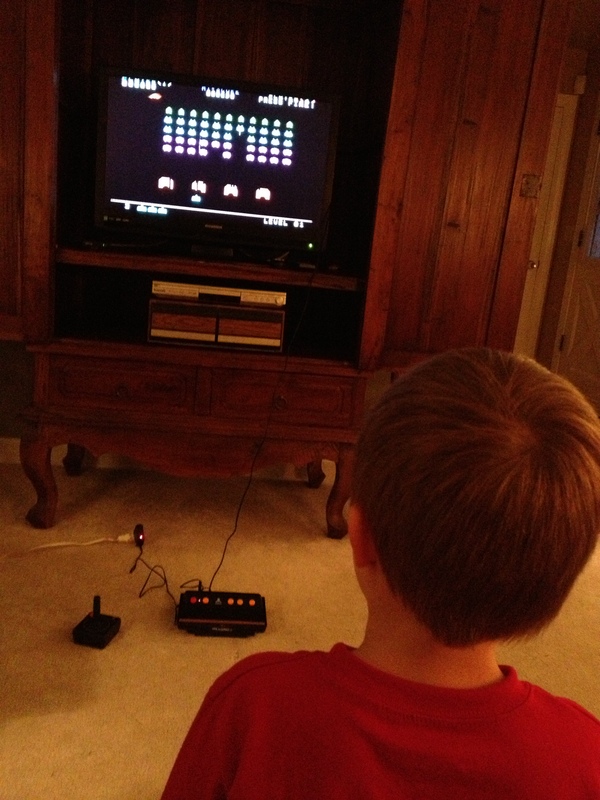 This entry was posted in Uncategorized and tagged 40th birthday of video games, atari, Atari Flashback 4, brothers, Carlton, children, Christmas, Combat, contemporary South, family, Harris, intelivision, Lake Wales, Lance Elliott Wallace, Lance Wallace, New South, New South Essays, NewSouth, parenting, South, Southern, Southern Culture, Southerners, the South, video games, Wreck it Ralph. Bookmark the permalink. Here’s a cool video on the history of video games: http://www.youtube.com/watch?v=NYtqmo7gpdo. I meant to include it in the blog, but thought it would make an added bonus for those who find the comments section. Enjoy! When we saw it, we knew we had to get it for you boys. Since it was on back order, I guess there were other 40 year olds that felt the same way. I ordered it December 4th, plenty of time for Christmas, I thought. I’m glad you like it. Yes, we hooked it up to the TV in the basement today. For some reason, it took me four times as long to do the laundry. It also reminded me of when Dad set ours up in Maw Maw’s old delivery van. 40 years old. That’s hard to imagine. Pong was the first video game I played. Then came the Atari. At that time, the one and only game console I vowed to ever play, so I thought. Donkey Kong, Pac Man, Space Invaders. These were the best games until the Nintendo. By far,my favorite game console of all time. I love Mario Brothers and Tetris. One fond memory is playing video games with Carla and my sister. We would sit in front of the TV and play till our hearts content or until our mothers called us to dinner. That is the best memory of all. I think I saw that guy on the TV… Something about auctions and Ms. Pacman, I think. Seemed like a really smart guy. My parents still have my first video game which, of course, is Pong!